The Tormenta card is a 2-T1 port ISA card manufactured by Zapata Telephony. These firgure below shows a picture of a Tormenta card. The Tormenta cards ahve the lowest level of signalling performance due to the ISA bus and the lack of on-board HDLC functions. Transfers to the host processor over the ISA bus use I/O port and ISA DMA transfers. OpenSS7 does not support a driver for this card. See the Status page for this card for more information. Although it is possible to convert the OpenSS7 drivers to work with this ISA card, it would be rather pointless as their are better PCI cards available. 2 T1 spans per card. DMA transfer of octets from framers to ISA bus. ISA I/O Port with DMA support but no memory mapping or burst transfers. Ultimately, the performance limited factor of the Tormenta cards is the bandwidth of the ISA bus and the ability of the processor to perform Soft-HDLC and TDM switching in software. 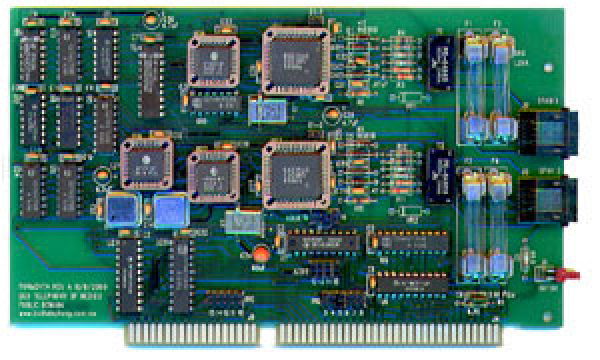 A 350MHz processor is capable of handling the bandwidth ofseveral of these cards, however, the ISA bus is not capable of more than one card. For the OpenSS7 VoIP Switch, this performance is dismal. This is why a driver has not been writtenfor this card.